Providence Homes is excited to announce that we are nearing completion on the “Home from the Heart” for Builder’s Care located in The Crossing at Nocatee in St Johns County. This 100% ENERGY STAR® Certified Ellaville floor plan features 2,798 sqft, 4 Bedroom and 3 Bath is currently available for sale – MLS# 835822 – 29 Skywood Trail Ponte Vedra Fl 32081. The goal is to raise more than $100,000 from the proceeds of the sale for Builders Care, a faith-based nonprofit construction contractor whose mission is to provide affordable construction services to the elderly, disabled, and other nonprofits in Northeast Florida with the kindred purpose of building a better habitat for all. “We are so proud to announce the Home for the Heart campaign. As a faith-driven company ourselves, we are humbled by the opportunity to give the profit from the sale of one of our homes to such a deserving company. Builders Care does amazing work in our community for those in need and we are happy to be a part of their impactful efforts,” says Sean Junker, President of Providence Homes. “Home from the Heart” is a collaborative effort between Providence Homes and trade partners. Together through the generous donations of time, labor and materials the “Home from the Heart” will be built as cost efficiently as possible in order to maximize the profit given to Builder Care. It is our goal to create a repeatable “Home for the Heart” program that other builders can model and use in the future so this becomes a major fund raiser for Builder Care each year. For those not familiar with Builders Care is the charitable arm of the Northeast Florida Builders Association. They combine purchased and donated material with volunteer and professional labor to provide cost effective construction to those in need. For many, Builders Care is their last hope to maintain any quality of life at home. Builders Care specializes in making homes handicapped-accessible, repairing roofs, sidings and leaks, painting, making general repairs, and installing heating and air conditioning. The ultimate goal of Builders Care is to provide quality home reconstruction to those who are unable to afford it otherwise. "The amount of money Providence Homes anticipates raising for Builders Care is enough for us to repair 4 roofs and build 2 wheelchair ramps each month for a year. Bill Cellar and Sean Junker have huge hearts, it’s amazing to see them use their company as a platform to help so many," says Justin Executive Director for Builders Care - builderscare.org. A Special Thank You On behalf of our entire Providence Homes Team we would like to thank all of our trade partners and manufacturers who so gracious donated their time, talents and materials: A & G Construction, Advanced Trim Solutions, Air Flow Designs, Amason's, American Insulators – Insulation, American Insulators – Specialties, Apex Technology, Beacon Sales, Bobby Campbell Roofing, Bouziane Tie-Down, Builders First Source, Cornerstone Paint, D & D Garage Doors, Donna Stanton, Duncan Plumbing, Environmental Materials, First Coast Supply, First Quality Gas, Group 4 Design, Hicks Land Clearing, Hicks Trucking & Fill, Italian Terrazzo, Jax Building Science, Jean Alix Compere, Legacy Engineering, Munson & Bryan, NE Florida Mailbox, Onsite Safety, Pamela Maxwell, Royal Painting, Southern Scapes, Steven Stratton, Vermont Lighting, Visionaire ,Walker Block, Weather Barriers, Woodsman Kitchens, Owens Corning, Foundation Building Materials, Moen & Argo Ready Mix About Providence Homes Headquartered in Jacksonville, Florida, Providence Homes is committed to providing the highest standards of residential construction in northeast Florida. 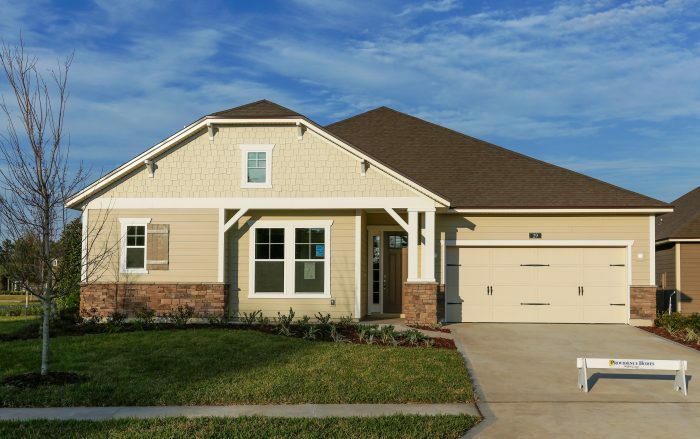 As one of Jacksonville’s only 100% ENERGY STAR® Certified builders, Providence Homes pledges to make a difference in the industry by building every home with the same detail and commitment to excellence they would with their own. For additional information contact Melissa Matthews at 904-337-5236 or email salesinfo@providenchomesinc.com.